The association of “La Plaine au Bois” was formed at the initiative of the mayors of Esquelbecq (Mr. Jean-Michel DEVYNCK), Wormhout (Mr. René KERCKHOVE) and Ledringhem (Mr. Christian DEBLOCK), Mr. Guy ROMMELAERE, historian and Mr. Jack SQUIRE, vice-president of the Royal British Legion. The purpose of the association is to preserve this place of memory where the massacre of “la Plaine au Bois” took place in Esquelbecq. To achieve this goal, the association raised enough funds to buy the pasture, in December 2000, with the financial aid of the British newspaper "Daily Mail" that supplemented the association capital. The British newspaper "News of the world" financed the reconstruction of the barn where the massacre took place. It took a sustained effort over many years to raise the public’s awareness on the history and the events that occurred at the end of May 1940 on the site. Since its creation in 2000, the French-British association of la Plaine au Bois wanted to create a museum space dedicated to the history of this site of memory that traces the background of the Battle of Wormhout-Esquelbecq-Ledringhem and the rearguard fights of Operation Dynamo, often unknown. This museum space is now a reality thanks to the work of Messrs Richard DELAUTTRE, Patrick LIVOURY, Guy ROMMELAERE (historian), the Municipal Association of French-Welsh twinning Wormhout-Llandudno, as well as the city of Llandudno (Wales). • The second room is reserved for the projection of BBC documentary and reconstruction of the events that occurred in the region, in May-June 1940. Documentaries english spoken and french subtitled. The museum space is in constant progress. Other donations or loans will further enrich it and thus contribute to the memory of the events that occurred during the Second World War and the men who sacrificed their lives for our freedom. If you wish to donate items relating to this period, you can contact the Plaine au Bois association or ask for Férial at Esquelbecq Tourism bureau. Admission fee : 2€ per person. 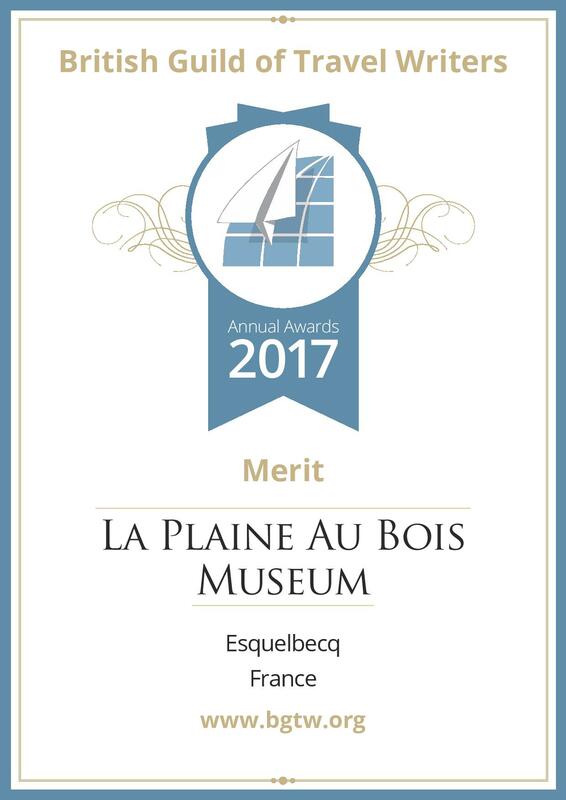 The Plaine au bois Museum was awarded the 2017 Merit Award by the British Guild of Travel Writers. Congratulations to the team of volunteers who worked so hard and helped create this museum.